Are you looking for the best lawn care provider in St. Charles County? 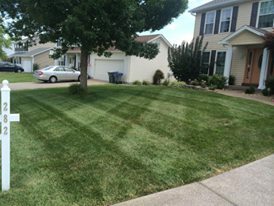 Welcome to Greenside Lawncare, who for 10 years has been St Charles County’s most reliable lawn care provider, servicing both residential and commercial lawns. From Main Street to Winghaven and everything in between, Greenside is ready to go the extra mile to ensure that your lawn stands out from all the rest. To be the best lawn care provider in St. Charles we offer not only lawn care but we can be all in one lawn care and landscaping company to keep your landscaping up to date all year long. Whether it is a family gathering, vacation, or a busy work schedule we can keep your hedges, bushes, and beds in check all year round or on an as needed basis. We have programs that will not just ensure your lawn is always looking its very best, but your plants and bushes in check. Submit an online quote request here. Receive the service agreement in an email. Sign on your phone and wait for our call. Greenside Lawncare is dedicated to keeping your property’s exterior looking its very best and offers programs that will keep your lawn, plants, bushes and mulch in check all year long or on an as-needed basis. At Greenside, we pride ourselves in providing the absolute best lawn care services. Our ultimate goal is to make your lawn the talk of the neighborhood and by taking the time to focus on quality of service rather than speed.